Drs Judith Allanson, Jonathan Gillard, Fazal Hasan, Mike Knapton, Arnold Fertig, Martin Johnson, Visvan Navaratnam, Theresa Marteau, Andrew Sharkey, Samuel Perkins, Tom Turmezei, Ali Amini, Dylan Mac Lochlainn, Abteen Mostofi, Erin Weatherstone, Liam Flynn, Sanjay Jariwala, and Rishi Umeria (CCMS President 2018-19). The first Tim Heymann Memorial Travel Prize winner, Alisha Chauhan, was presented with her certificate and cheque by the Master Jane Stapleton at the Christ’s College Medical Alumni Association Conference in April 2018. Alisha gave a presentation about her elective to Australia where she worked in three locations – the New South Wales Helicopter Emergency Medical Service (HEMS), Nepean Hospital and the Blue Mountains Hospital. These two hospitals are in New South Wales and are linked to Sydney University but located outside the metropolitan area. Alisha was able to experience paediatrics and stroke/rehabilitation medicine in these district hospitals. Alisha reported back that the HEMS provided her with experience in managing acute cases such as stabbings, falls and road traffic accidents. Immediate measures to stabilise cases and conducting safe transfers in the helicopter was very useful for her training especially in resuscitation and anaesthetic care. Her most memorable experience was attending to an 8 year old who had fallen from the 4th Floor flat and having to assist the assessment, sedation and management of the open femoral fracture. The hospital experience was similar to her UK experience with clerking patients and presenting them to the consultant led teams and she found all the staff to be keen to teach and provide opportunities for direct clinical care. Her paediatric work involved attending emergency caesarean sections and assisting with the neonatal resuscitation and transfers to the NICU. Working in these different settings helped her understand the Australian healthcare system. The cost of living in Australia is comparatively high so the prize cheque from the Tim Heymann Memorial fund was gratefully received! Sir Keith Peters (Fellow) who has been honoured by the award of the Knights Grand Cross of the British Empire (GBE) for services to the Advancement of Medical Science. Also since our last newsletter Prof Theresa Marteau (Fellow) has been appointed Dame Commander of the Order of the British Empire, and Prof Jim Smith (m1973) has been knighted for services to Medical Research and Science Education. Our Secretary Dr David Thomas (fellow) has been awarded a Stage 2 Wellcome Trust Clinical Career Development Research Fellowship (CRCDF) with a major grant to support a team of researchers. This follows David winning several prizes and is a very competitive process. This conference on the theme Choosing Careers was well attended and successful event. Prof Paresh Vyas a Professor of Haematology from Oxford was the keynote speaker and was ably supported by an interactive session with Dr Mike Timmons who has published his approach in BMJ Careers. Timmons, M. Choices, choices:how to select a specialty. BMJ Careers 7th April 2016. 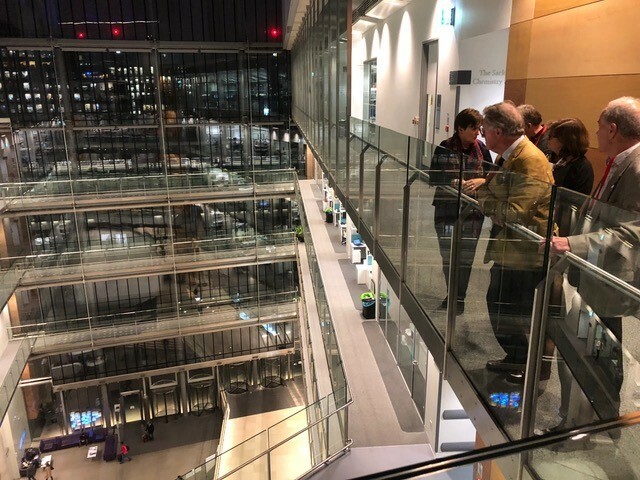 The Steering Committee had a meeting in November 2017 The main items in the discussion were the planning of a joint visit to the new Francis Crick Centre and the forthcoming April 2018 Conference. Details of the new Tim Heymann Travel Scholarship prize were clarified and the prize winner will be announced at the next conference after a competitive process involving Christ’s College undergraduate and clinical students. Tim Heymann’s widow Amanda Rowlett will be joining us for the award presentation. The CCMAA is open to any Christ's member who studied medicine or went on to work in a medically related career. The association aims to bring together members sharing a common interest in both medicine and Christ's at regular intervals in Cambridge and elsewhere to promote the exchange of ideas, to network and last, but by no means least, to socialise. Events usually feature discussions, lectures and a dinner. All alumni who are recorded as having studied medical sciences, natural sciences or affiliated subjects are invited to CCMAA events. Alumni who have gone into medical careers subsequently are also very welcome. On behalf of the CCMAA, Dr Tom Turmezei (m. 1996) is running a profiling project of medical alumni to build a database of information on areas of expertise, interest, research etc. If you would like your profile to be included, you can contact Tom on tom@turmezei.com. The steering committee is now developing this initiative in conjunction with the Christ’s College Medical Society (CCMS) by creating a new website for alumni that will be linked to the CCMS website so that we can build network and mentoring opportunities between alumni and current preclinical and clinical students.